So on Sunday, I kneeled down to get a pot out from under the cabinets and ZING - I felt my lower back muscle go out. I ended up in bed with ice most of the day. Monday morning I woke and headed to the Chiropractor and got an adjustment and some therapy. I did not have a chance to get through your blogs as sitting up to read was not working. Last week was the 31st anniversary of his death. I truly can not believe it was 31 years ago. Thurman was a warrior...a throwback to the baseball players of the 30's and 40's. Never did a game end where his uniform wasn't covered in dirt and grime. He loved the game...loved to play it. He grew up in Canton, OH, home of the Football Hall Of Fame. He played football in high school, he also played basketball and of course he played baseball. He played all three well enough to receive scholarship offers for all three sports. He went to Kent State to play baseball and that is where his career took off. In the summers after '67, Thurman attended the Cape Cod League and played for Chatham. Yankees scout Harry Hesse took notice of Munson and during Munson's senior year at Kent State, Gene Woodling began to watch him regularly and insisted that the Yankees sign him. In June of '68, Munson was the New York Yankees' Number One pick in the amateur Free Agent Draft and he received a $75,000 bonus. Munson played with Binghamton Triplets in the Eastern League for $500 a month and Syracuse during his short minor league career of 99 games. The Yankees called him up during the '69 season. Munson played so well during '69 season that he won the job of starting catcher in spring training. Munson won the American League Rookie of the Year award in 1970. He was an excellent defensive catcher and won 3 consecutive American League Gold Glove awards in 1973, 1974, and 1975. THAT IS SPECIAL..BUT, what most forget is, he was an outstanding fielder, he made only one error while behind the plate in 1971 (he was knocked unconscious by a runner and the ball was dislodged). THINK ABOUT THAT FOLKS! He was brilliant in the physical as well as mental aspects of the game and could throw on e of the fastest releases ever seen in baseball. Even as a rookie, if a veteran pitcher shook him off, he would march out to the mound and in his own special way, make his point. Normally, the next pitch was the one Thurman wanted. Munson was the best clutch hitter in his prime and hit more than 100 home runs and batted better than .300 from 1975 to 1977. 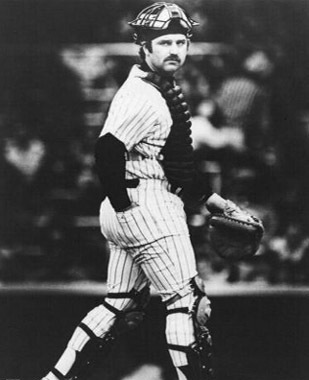 In 1976, Munson was named as the first Yankee team captain since Lou Gehrig and won the American League's Most Valuable Player award that year as well. He was no doubt the most respected man on the Yankee team and helped them win 3 American League pennants and 2 World Championships. Munson also was selected for 7 All-Star games during his 11 year career with the Yankees. Those are the biographical statements about this man. What I remember as a Yankee fan in the 70's was watching this gruff, squat player dominate from his position. In the beginning, players trying to score would attempt to run over Munson. What they learned was you can not run through a cinder-block wall. The collisions were fierce and Munson won most of them, holding onto the ball a nd getting the out. 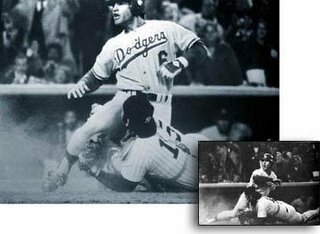 This also took it's toll on his body, and I can remember later in his career Thurman on the ground, crawling to get up after getting hit with a foul ball...willing his body to respond. He always went 100%...even more if he could. 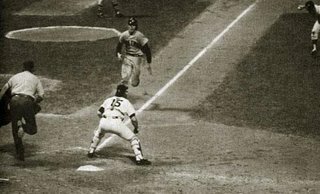 His throws to second base to get base-stealers was electric...he would get the ball and his release was instantaneous...A bullet..always on the bag it seemed. When my son Matt decided to be a catcher I found pictures of Thurman throwing. The perfect form...releasing the ball just by his ear "That is how you do it" I would tell Matt...and he learned. Thurman's battles with Reggie Jackson were legendary. When Reggie arrived, his "I am the straw that stirs the drink. Munson can only stir is bad" began the war and they were never close. But they both busted their butts to bring success to the Yankees and that is what they were about. I remember a quote by Thurman that went something like this "There are 25 guys on our team. No way you are going to like all of them, but that does not matter as long as you all play together on the field." August 2, 1979Frank was watching TV.. he turned off the TV and said "Come sit down." I said i was going to change and he said to do that later...just sit down. I went to the couch and he turned on the TV again. The news was on and then they repeated their top story..."Thurman Munson, Yankee captain and Captain died a short time ago in an airplane crash outside of Canton, OH." Just typing those words, I get chills. I know that I did begin to cry. Shaking my head. How could this be? How could this wall of a man be gone? It was all a blur the rest of the evening...but I watched what I could on the story. Of course, without cable and ESPN and all..it was only the local news, but soon the film of the smoldering plane came across the screen. i even remember one shot of a boat shoe sitting in the wreckage. Thurman never wore socks off the field and you knew whose shoe it was...That image is still in my brain. I said he loved baseball..There is only one thing he loved more and that was his family. He met his wife Diana when they were 12 years old. That night, she remembers writing "Mrs. Thurman Munson" on a piece of paper over and over. She told her father she was going to marry Thurman Munson and he, the true Italian father said "What IS a Thurman Munson?" Diana and Thurman married in September of 1968 and began their family. His love for his kids is what became his ultimate downfall. Why? Because he ended up buying a prop-jet so he could fly home on off days during the season. He eventually bought a jet to make the trips shorter. This is the jet he was doing touch-and-gos in on the afternoon of his death. The two men on the plane with him both credit him for saving their lives. Thurman's inexperience caused the crash...his drive to never give up is what allowed him to get the plane down to the ground without exploding. Unfortunately, Thurman was trapped in the wreckage and when the flames began, his friends could not get to him and he perished. The Yankees played that night ( a Friday) and lost a 1-0 game to the Baltimore Orioles in front of 51,151 fans. Louis Tiant pitched a 2 hitter for the Yankees, unfortunately one of those hits was a home run. Homeplate was empty when the Yankees took the field and Cardinal Spellman of New York was there to say a prayer. I had tickets for that game for a while with seats in the loge section of Yankee Stadium on the first base line. I was there with 2 friends, my frat brother Greg and a lady I was dating at the time. After the prayer, they asked for a moment of silence. Greg says, I was one of the fans who started it - I am not sure it is true - but when Thurman's picture went up on the Jumbotron, I know my hands came together and kept going..clapping. And the stadium erupted in a thunderous sound of hands clapping and people crying...Not shedding quiet tears, but full-out bawling...me included. I remember looking down and seeing my t-shirt drenched with my tears. I have heard it went on for 8 solid minutes. It felt like an eternity. "It seemed like the tribute lasted forever," Reggie Jackson said. "Players were standing on the field with their heads bowed, crying and weeping. It was horrible." The Yankees starters stood at their positions, and the other players stood on the dugout steps. "When his portrait and a message of inspiration appeared on the giant TV screen, there was an outburst of applause," Jackson said. I spoke with Greg and one of his recollections is of Lou Pinella, standing in the outfield with his face in his glove. As they showed clips on the scoreboard the fans were yelling "MORE...MORE" and Pinella would lift his head up to see what was showing and then put it back into his glove. Then, 3 days later on Monday - the funeral. That night the Yankees were scheduled to play in the Bronx once again. George Steinbrenner called the MLB office and told them he was chartering a plane for the entire team and staff to go to Canton. "The league told us if we didn't get back in time for the game we'd have to forfeit it," Steinbrenner said. "I told them if that happened to stick it. If we hadn't gone, I think it would have hurt the team even more." Teammates Lou Piniella and Bobby Murcer delivered eulogies. Lou Piniella read from the Scriptures and then said, "We don't know why God took Thurman, but as long as we wear a Yankee uniform Thurman won't be far from us. As a baseball player he was one of the best competitors. He played rough but fair. He was also a kind, affectionate, friendly man." His voice choked and he walked off the platform. 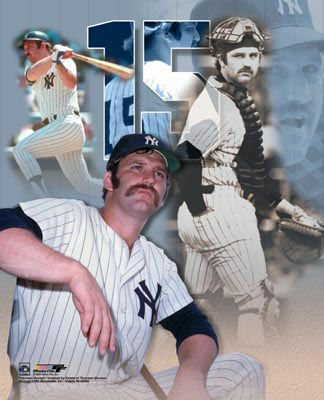 "As Lou Gehrig led the Yankees as the captain of the thirties, our Thurman Munson captained the Yankees of the seventies. Someone, someday, shall earn that right to lead this team again, for that is how Thurm -- Tugboat, as I called him -- would want it. No greater honor could be bestowed on one man than to be the successor to this man, Thurman Munson, who wore the pinstripes with number 15. Number 15 on the field, number fifteen for the records, number fifteen for the halls of Cooperstown. But in living, loving, and legend, history will record Thurman as number one." I remember watching on TV, these big men, bawling like babies...holding each other...unable to even stand on their own wondering how they could even play a game after what they went through. I did not have tickets for that evening, but it became a nationally televised game with Howard Cosell reporting. Not only did the Yankees make it back to New York for the series finale against the Orioles, but they won 5-4 in dramatic fashion. Murcer drove in four runs and blasted a game-winning homer. Steinbrenner sat with the late Howard Cosell after the team arrived back in New York. "He told me, 'Your guys are going to be dumbstruck out there today.' I shot back, saying, 'You don't know the inner strengths of these kids, these players. You wait and see.' Murcer had one of his best games." His #15 was almost immediately retired by the Yankees. That evening, clubhouse manager Pete Sheehy, on orders from Steinbrenner, cleaned out Munson's locker. He left only a pinstriped shirt slung over a hanger, the NY facing out, a pair of pinstriped baseball pants hanging loosely on a hook, a Yankee cap on the top shelf, and across from the shirt, his catcher's mask on another hook. Atop the locker was a metal plate bearing simply the number 15.There it remains, to this day, as a new generation of Yankee heroes, walk past the locker through the clubhouse to the trainer's room for treatment and privacy from the press. Derek Jeter now occupies the locker next to Thurman's, a tribute to his being the Captain of the Yankees. "Our captain and leader has not left us, today, tomorrow, this year, next... Our endeavors will reflect our love and admiration for him." He has never been inducted into the Hall Of Fame. Some say, he did not have the stats over a long enough period of time. Some say it is because he pissed off so many sportwriters...I don't know why...all I know is, he was one of- if not THE best- at his position during his playing years and should be given the honor. He was surly...he never got along with the press...but he touched so many lives....mine was one of them...but most of all he was a man who loved his family more then anything. Ironically, in the end, this is what caused us to lose him too soon. Of course you know during that time, as a Dodger fan, I was a Yankee-hater. I wasn't a member of that Yankee-hating nation that hated just because they won all the time. I hated the Yankees because of the history of the Dodger-Yankee rivalry. It was what a Dodger fan did. But there was one Yankee...Thurman Munson. He was baseball. Couldn't hate Thurman. Wait. You did the show last night? But, you said on FB it was canceled. Or did I dream that? First off you have my sympathies on your back, last time mine went out like that was when I bent down to get a yogurt out of the refrigerator and could barely walk for the next two days. I truly can feel your pain and hope you're back up and about soon. Great, great tribute post to Thurman Munson. I've never been a Yankees fan what with living in Red Sox territory and there's that whole rivalry thing going on but no matter team you route for, you have to love a guy like Thurman. His death was truly a tragedy on so many levels. That had to be quite the experience to be in Yankee stadium with the other 51,000+ fans; had I been there, I would have been bawling my eyes out, too.